Medicine has always had it regulatory fiefdoms, but in 2002 they were greatly expanded. At that time, a charter on "medical professionalism" was published by the American Board of Internal Medicine, the American College of Physicians, and the European Society of Internal Medicine in the Annals of Internal Medicine that touted three fundamental principles: (1) the principle of primacy of patient welfare, (2) principle of patient autonomy, and (3) principle of social justice. The first set of professional responsibilities for physicians was a "commitment to professional competence." While I would truly like to believe this article was sincere, increasingly I am concerned it was a regulatory ploy - one that is more concerned about financial gain than patient benefit. I have spent time reviewing the 2011 IRS Form 990 "Returns of Organization Exempt from Income Tax" (the last ones publically available) for each of the member boards of the American Board of Medical Specialties (ABMS) and the ABMS itself. I used the website Guidestar.org to gather these. I assembled the salaries and benefits of the senior executives from each of these organizations in descending order and was surprised what I found (here is the complete 2-page pdf of the data for your review). No more than the top three executive salaries of these organizations represented over $16 million in total compensation in 2011 alone. But even more troubling was the negative relationship that existed between the top-paid executives of these private ABMS member boards and the 2011 compensation for working subspecialty physicians they are supposed to represent. 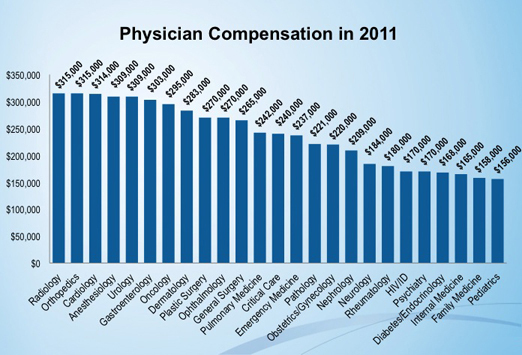 Recall that pediatrics, family medicine, and internal medicine are consistently some of the lowest paid physician subspecialties. Clearly, the US physician credentialing system as it exists now overwhelmingly rewards people with regulatory oversight rather than those who provide patient care. Was this the intent? More specifically, was the intent of the ABIM's "medical professionalism" manuscript to line the pockets of the ABMS member boards in lieu of social justice? What kind of justice is this? The answer now is not so clear. To add insult to injury, realize that front-line physicians are increasingly burdened by very high medical school and residency debt for much of their career. As part of their rite of passage into their subspecialty, they must pay the credentialing fees that pay the salaries of these regulators. Should we insist our doctors pay such high fees to support these expensive salaries? How might patients be affected, especially when they have reduced access to doctors who must undergo repetitive certification and re-certification exercises. How do patient's benefit when the certification process appears so flawed? To me, it seems that we are not seeing a definition of "medical professionalism" in the credentialing juggernaut that these private organizations have created. We're seeing the definition of "greed." 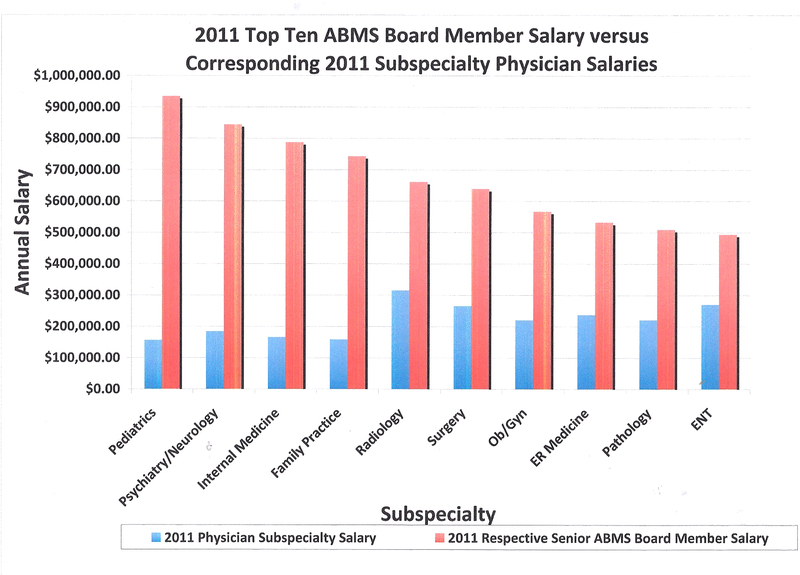 PS: Physicians are welcome to print out the pdf of 2011 ABMS Board members' salaries to share with colleagues and to sign the petition to stop the new onerous biannual MOC recertification requirements. I have struggled to discern the motivations of those who wrote the new medical professionalism and why it was important for them to insert social justice and pretend that social justice was part of medical professionalism all along .Then somehow they manufactured a link to stewardship of "society's resources"and then claimed that following guidelines was the path for physicians to further social justice and guess who would write the guidelines. But I don't quite grasp why the 1992 publication would be considered a ploy to increase their regulatory power or how that benefited them financially. Thank you for posting these data. As a non-medical, average guy (a patient), I feel this is obscene. I hope doctors everywhere learn more about this and demand change. The charter of “Medical Professionalism” is DOA. It is replete with physician responsibilities, failing to acknowledge in any way, a fundamental necessity to include a counterpoise of physician autonomy. As written, a more appropriate title for this charter should be “Medical Subjugation”. In actuality, physician autonomy strengthens the ‘primacy’ of patient welfare and autonomy. It creates a moral and mutually respectful contractual relationship between two human beings. Now, what about the principle of social justice? Social justice is an imprecisely defined abstraction that conjures up collectivism in full bloom. A utopian destination with an imaginary street number. It strains credibility that these organizations could seriously include this claptrap in a charter that proclaims legitimacy. Physicians who cherish their autonomy need their own charter of “Medical Independence” to spread the word, one patient at a time. A well written brochure perhaps, challenging the self-assumed propriety of these malevolent organizations. "Do you know what it takes to perform a heart operation? Do you know the kind of skill it demands, and the years of passionate, merciless, excruciating devotion that go to acquire the skill? That was what I could not place at the disposal of men whose sole qualifications to rule me was their capacity to spout the fraudulent generalities that got them elected to the privilege of enforcing their wishes at the point of a gun." This is great and eye-opening work that you've done here. I often struggle to understand this system I work in. Thank you for the information. do you know if any off the larger organizations are pushing for change in the regulation of physicians? I can only hope these over paid parasites require life sustaining medical care one day and is it is not available to them because of what they have mandated. Would that not be blissful justice? I am with you 100%. I hope that you have the wherewithal to lead the troops in some greater capacity. Doctors are busy, tired, stressed, struggling, and not well-versed in the art of protest and policy. But we would rise to support a leader. If you can think of what ordinary docs should do, or maybe get an email list going or social media with some specific things to do (the petition is a great idea) I think a lot of people would listen. Everyone complains, but nobody is sure what to do.